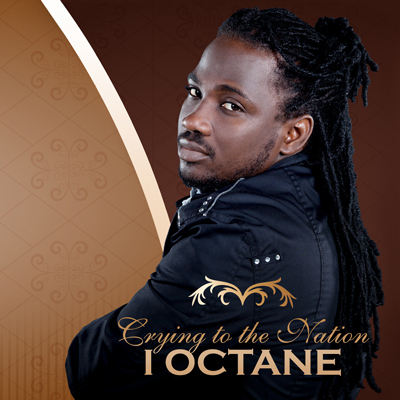 “I-Octane's fusion of hauntingly sung vocals with rapid-fire rhymes…reaffirm dancehall's significance as a vehicle for compelling commentaries and praising Jah…"
VP Records and Scikron are proud to announce the release of I-Octane’s debut album, ‘Crying To The Nation,’ available January 31, 2012. As one of the most-talked about artists emerging from Jamaica, I-Octane’s first full-length LP will reinvigorate the feeling of roots and dancehall at its purest. He has already proven himself as a lyricist with rapid-fire delivery, and unveils his uncanny ability to sing romantic ballads and socially aware tunes on this traditional reggae album. "I feel good about all the songs I've done since I have started out, but this album is very special to me because I got the chance to make the type of songs that I really enjoy and meds the music in a different creative way. My fans will get to see another side of me and after all the challenges I've faced in the industry, seeing my first album is a great accomplishment. I give thanks for that," states I-Octane. Most of the album’s tracks have never been heard with the exception of the pulsating dancehall anthems "Nuh Love Inna Dem" and “Puff It” as well as “Lose A Friend,” arguably his biggest and most requested song to date. The latter tune hit number #1 on Jamaica’s charts – remaining at the top for approximately 16 weeks – and experienced new life again when Jamaican officials declared a state of emergency after Kingston’s gruesome gang-related attacks. This year, Billboard magazine enlisted I-Octane as one of their 15 Artists Impacting The Indie Scene. In a rave review for his latest mixtape ‘Focus’ (produced by Livity Movements), the New York Times adds that his recent performance at Jamaica’s largest annual music festival, Reggae Sumfest, was “focused and intense’ and stood out for“bonfires getting stoked throughout the crowd. In the language of Sumfest, that’s an endorsement, a big one for this young singer." In his short five year career, he has already received a total of 20 nominations and awards, including 3 wins at this year’s Excellence in Music Awards (EME) for Breakthrough Artist, Best Male Singjay and Best Reggae Song for “My Life,”Best Performerat the 2011 Clarendon Music Awards and Jamaica Observer’s title for Male Singer of the Year. Digicel, the largest mobile telecommunications operator in the Caribbean, selected I-Octane as its brand ambassador for the company's 'Next Generation' campaign in 2010 and as their sole entertainer for 2011. Over the past year, I-Octane kicked off an extensive tour spanning 40 cities in North America as well as the shores of Japan. In addition to his buzzworthy mixtape, he is set to release a digital EP ‘Straight From The Heart’ in early December prior to his debut album. In 2012, ‘Crying To The Nation’will solidify his position as a multi-faceted reggae artist, proving his reach beyond dancehall with his added repertoire of touching love songs and cultural tunes. This refreshing approach to the genre holds a bright future for the ever-evolving artist.